One of the many cool things about the world is that it's always gonna be summer somewhere. Whilst we freeze and shiver here in the arctic Northern Hemisphere, our Southern counterparts enjoy hot days and warm nights, and vice versa of course. As such, it means that the music of summer never stops being produced, never dies, so there's always something to get your blood up to temperature and whisk you away to tropical shores, rosasite seas, waves breaking slowly on the reef, still lagoons, breadfruit for breakfast... long live our tropics. Why do I speak this way? It's because of this song by Melbourne producer DCUP, 'Magic'. Just one day old right now, the song comes from a legacy of hot-blooded tracks including the very nice 'Don't Be Shy', which included a remix by Japanese purveyor of emotional and retro house, Boys Get Hurt. I was touched by the message that DCUP, aka real person Duncan MacLennan, left as a description for the song, saying its purpose was "...to not only keep you dancing through these beautiful summer nights down in Oz, but to keep our friends in the North warm on their chilling winter eve's." That's what I like to hear. A bit of togetherness. Global community spirit. True to its name, 'Magic' is a little goûter of magic. Within seconds of the track starting an unbeatable bassline pops in with a funky bounce, soon joined with samba type piano chords, augmented with excitable bweeps and the occasional flash of synth chords. That samba rhythm in the music gives the track a hot and sweaty atmosphere, something sensually calling out with a wink in a where-will-this-lead manner in the midst of the driving slo-house, disco-evoking beat. The sample of some husky voice saying "Magic..." is a great touch, beautifully placed dynamic punctuation in this exciting sentence of music. 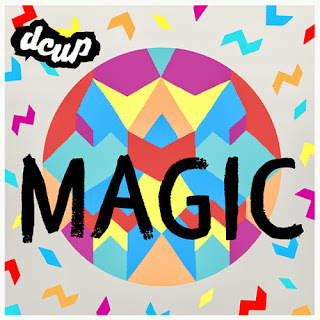 The mix of funk, latin and disco in 'Magic' lands in the cradle of your ears like something retroactive, a time capsule dusted off and polished with modern tools to give it a zeitgeistical familiarity whilst it shines with its own lustre: the sheen of nostalgic novelty alien past. It feels fresh, especially with those varying elements, and clearly comes from a mind that loves to create music for people to dance to. Fun fact: DCUP collaborated with Australian band Yolanda Be Cool for 2010 hit 'We No Speak Americano'; now that Latin lilt to 'Magic' makes more sense and I love DCUP all the more for it.